Ravalation: Gosh - it's a tablet! I got a tablet for my birthday! I feel so spoiled. I've always been a bit annoyed by scans of drawings ending up with a bad quality, no matter how good your scanner is. Black-in-white is okay, I guess, but it becomes a problem as soon as any drawings include colours. They just never get it right. So of course I was jealous when I saw what others (like Xhii from Roll one hundred) made on their computer, and not only because they're just amazing at drawing stuff (which they are). 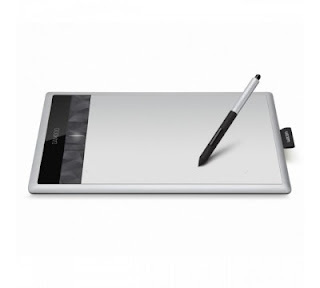 With a tablet, you are able to draw on a touchscreen with a fake pencil, and everything you draw ends up right on your screen. I'm not really sure why I got this present. I didn't really ask for it, nor do I think I'm 'good enough' to use it. I'm not a designer, I just draw for the fun of it. I really must have sounded very enthusiastic about it in the past. Either way, the thing was there, so it had to be tried out. So I drew something random that turned out to be the girl with the giraffe neck above. No, don't ask me about the neck. It was not intentional. I was just trying to find out how the damn thing worked! The first thing I found out, was that the line quality was very poor in the usual program I use for adjusting pictures (GIMP). It did look great in Photoshop, though, but I had never used that program before. So I had to try out two new things at a time. Written and drawn lines by pen look great. You don't really have to do anything for it. It only looks great in Photoshop, though, it looks terrible in GIMP. Changing between writing and erasing is quick and works really well. You can just turn your pencil around to switch between the two. In Photoshop it even saves the size of your pencil versus your eraser so you don't have to change that manually each time. Layers in Photoshop work very intuitive. Just felt it made sense. Apart from me starting to draw in the background instead of opening a new layer first. Lets not talk about that! If I want to draw a line, I don't get to see a "preview line" as you do in GIMP, so it's impossible to create parallel lines. I don't know how to select an already existing colour within the drawing you already have opened - pretty crucial for doing anything that involves colour (this is easy in GIMP). I can't find a "bucket fill" tool (also easy in GIMP). Searching the internet for specific tools doesn't get me any further. Trying to draw without looking at my hand feels like needing a third brain half that I lack. It's just so damn hard! It's like: "Hey, congratulations with your new tablet. You know what, you'll get a free time travel trip with it, how does that sound? Use it and you'll be torpedoed back ten years in the past and can draw with the skill you had back then. Have fun!" Aargh. The pen pressure (how thick/dark your line gets) is done very well, and it's a marvel of science that it works at all, but doing the same thing on real paper is still so much easier. On the picture on top of this post, the left sketch in turquoise was actually the easiest to draw. As soon as I tried to make it 'perfect' it was starting to get hard, and I had to use tools to get it to work. If you have any other tips or know of helpful websites, please let me know. It's hard to find a place to start. On a more positive note: it will be quite a while before I get anything done that doesn't make your eyes bleed, so don't worry, the next few posts of the coming half year will be all about LotRO and SWTOR again! Ohh, that's great! The picking up colours thing totally worked and I've made my first coloured sketch now. The only thing that keeps bugging me is that fill bucket. G doesn't work, but I did find the tool somewhere to the left. However, if I try to click something, anything, nothing happens. I'm probably doing something stupid here (selecting or not doesn't seem to matter). Any ideas? Yay 4 giraffe neck girl - very cute! I love drawings / sketches with construction lines BTW, gives it such a sort of architectural quality I find compelling. Thank you! I love the lines myself too, sometimes they look better than the actual result (or perhaps that's just me having the same preference as you). I believe I hold down the shift key when needing to draw a straight line with the mouse.. so there has to be some sort of way to do this with a tablet as well since it's possible in photoshop. And yes, layers are your friend in photoshop! Layer masks can also be your friend! Haha, congratulations on the tablet! I completely get the not-seeing-your-hand thing. That's the main reason mine sits unused much of the time. Yay for birthdays! Happy Birthday Rav! And I liked giraffe girl! Thank you too, kind Supergirl. I'm happy you liked it. Oh, cool to hear you own a Bamboo too! You should post some of your works on your blog, I'd love to see it.